The untranslatable Portuguese word, saudade, conveys a desire for a past moment that may be forever unattainable. In many directions this word speaks of the current situation we are facing, where going back to the sweet past seems to be so convenient because of the overwhelming desperation generated by the terrifying present and future. In the midst of globalization which reveals itself in the forms such as cross-border trade and cultural exchange, we are strongly searching for connection with others to identify ourselves, as well as ideals and hopes among the past and the future. Nevertheless, the ambiguous and unstable situation that we are situated in makes it rather spiny for us to grasp anything for sure. Saudade comes as an efficacious tranquilizer when human beings have to face the fact that we have begun to be centrifugalized after running too fast in the whirl of anthropocentrism, and that we are being forced into corners by information redundancy, as well as great regional, ethnic and social discrepancy in the multi-cultural context where creolization is yet to be fully acknowledged. At this stage, the further and deeper network sprawls, the more the syndrome of alienation and nostalgia gets reported, -so is in China, so is in Portugal, so is anywhere else. Yann Martel in his book The High Mountains of Portugal notes through one character’s mouth that everyone “smells of time and radiates solitude”. And it’s definitely not only a problem of 5-hydroxytryptamine. Before we come to the ultimate solution, which perhaps doesn’t exist at all, or at least won’t arrive in an apocalyptical way which many are longing in hope, roaming and resonating with the tranquilizer critically might just work as well. In The Book of Disquiet, Portuguese philosopher Fernando Pessoa touched on one of the signature-like art styles of Europe: Baroque. To him, Baroque is mobility, a process of passing through all things, constantly touch on the others, and to the end generally becoming the others, or in other words, becoming the Other to the Self. Umberto Eco regarded Baroque as a dynamic uncertainty, and questioned whether it was the Baptism that provided the prototype of Baroque. The festivity that once belonged to Baroque now seems to be history, but the contemporary age has its own form of festivity, embracing all the possibilities that human beings invent to fit in where we are, or to go back to the aforementioned concept, all kinds of tranquilizers that help us survive the somewhat awkward situation. Reflecting on these cultural and philosophical notions, I selected the 12 artists from Portugal and China, within whose expressions two remarkable characteristics stands out. The first one is the intimate relationship with the narrative of saudade. The notion “immemorial” in the exhibition title, The Immemorial Space in Time, refers to a place in memory that we are not able to remember, recall or touch. It is longing for admiration, yet it never arrives Here. It is a place in memory that one would wish to relive once more, yet at the same time, contradictorily, it is a place one can not memorize. The sense of distance in the narrative leads to new forms of abstraction, such as Guan Xiao’s sculptures, Vasco Araujo’s drawings and Rui Moreira’s drawings in particular. The other characteristic is the interwinding concepts including diversity, festivity, ambiguity, which often come in a set. 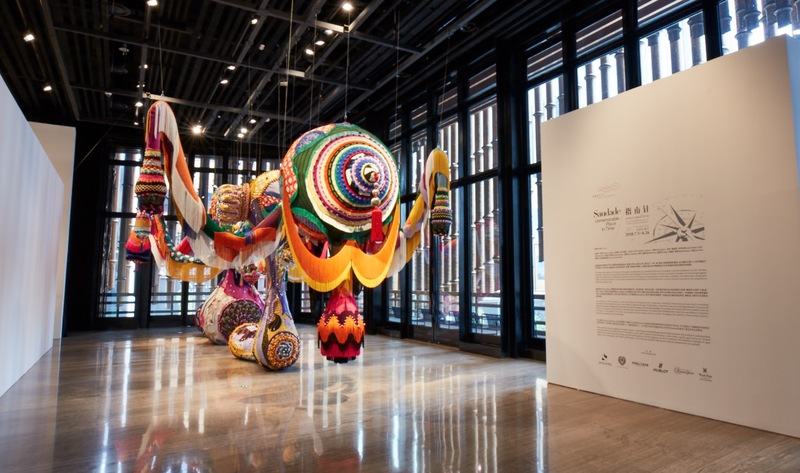 Joana Vasconcelos’s giant crochet work could be an intelligible example for this baroque open-up field contained in the artwork, as well as the Work in Space series of Luisa Jacinto. Personal and collective experiences are from different places in time and space, then get transformed to the present as an alternative vision, with which we should be able to ease ourselves and embrace the infinity of the universe. 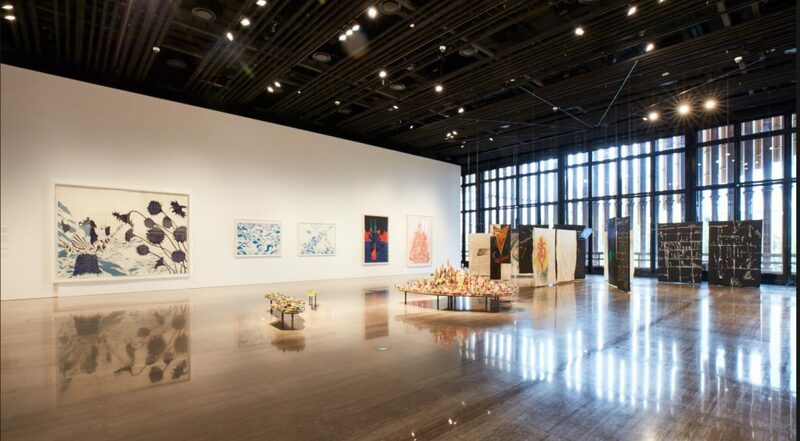 The 12 artists’ works are presented on the 2 floors of Fosun Art Center as well as the outdoor space. On the 2nd floor, 5 artists create a space of cosmopolitan imagination and dynamic trans-historical dialogue. Liu Jianhua’s work takes the place in the center, which megaphones towards the flourishing and prosperous modernization of Shanghai, while depicts the city as somewhat an island as if lack of root. This links to the historical wall of Sun Xun’s, which boldly warns us that the contemporaneity derives exactly from history, which is not necessarily beautiful and desirable as we imagined when dwelling in saudade, with the figure of magician who travels back and forth in time to reveal the unseen social and political scenery. 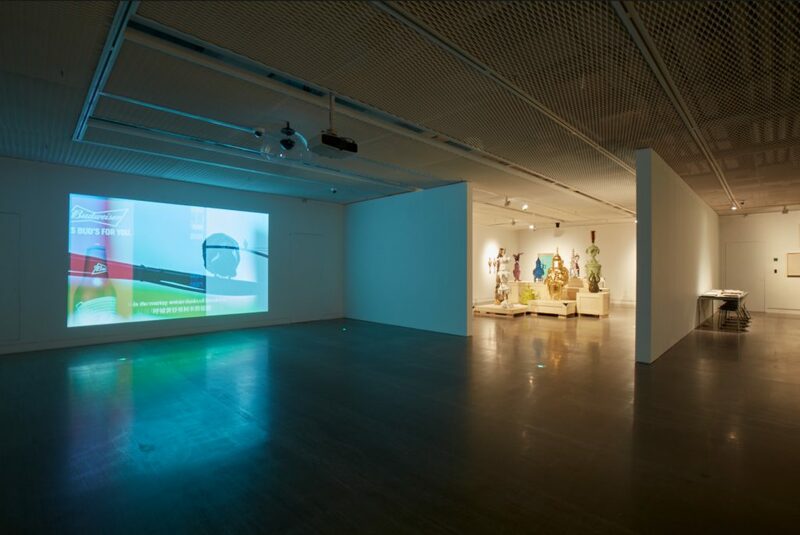 This vertical investigation in history is also observed in Andre Sousa’s installation, which goes back to look at the Portuguese’s primary encounter with the other side of the continent referring to the 20th Century literature PAISAGENS DA CHINA E DO JAPÃO, as well as other scattered conventions and practices such as whale hunting and the application of calendar. He leads us to flaneur horizontally to look as the world as a nondifferentiated whole, with which approach we are able to go back to the works of Rui Moreira and Joana Vasconcelos. Rui Moreira is an adventurer, who trace his memory of his personal history as well as the exploration of the global landscape. The images of dessert, exotic masks and costumes are tokens of this journey. Near the Entrance, Joana Vasconcelos’s work of great festivity and Baroque aesthetics eulogizes Portugal’s traditional technique of crochet and the craftsmanship. Recreating the tradition in the present while leave the past in the past might provide us a way to emancipate ourselves from the tangle of nostalgia. Following this path, various allegories of cultural intercourses are created on the 3rd floor from each artist’s perception of global mobility. Luisa Jacinto’s Flora Series could be seen as a rather romantic way of expression which enjoys a long-existing tradition of being poetic and abstract. 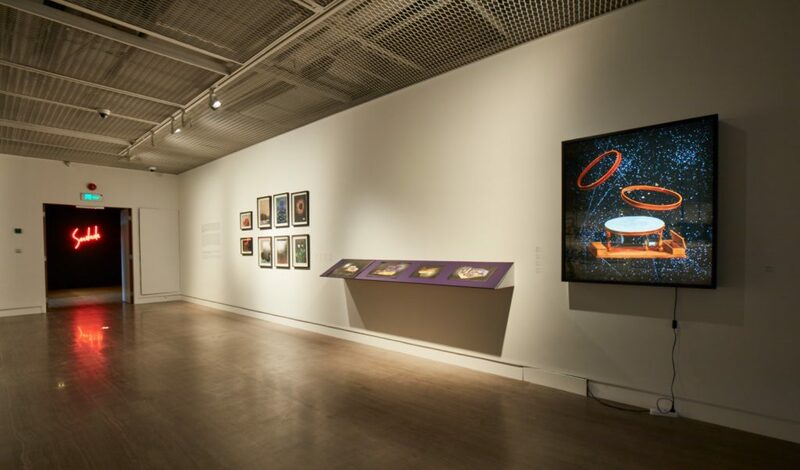 But on the other hand, the Work in Space Series tells a story never happened before, which contains the double angle of seeing humanity—from the mundane daily practice, and from the grant view of the universe. Our existence and fluctuation are precisely floating in the infinity, the past cannot be seen in our back, but rather in a different dimension in the sea of stars. 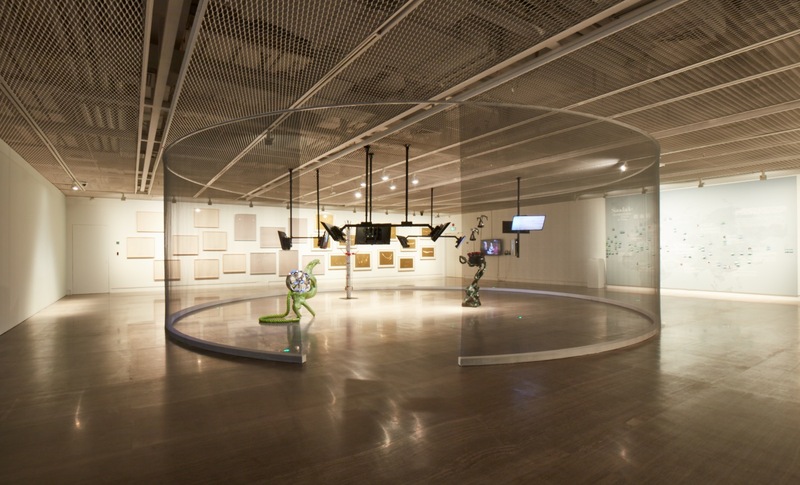 Guan Xiao brings us back to the reality of post-Internet age with her eery sculptures and instructive video installation. This dynamic display of the contemporary reveals the collective memory that each of us shares a bit. Among many, Cheng Ran goes for the gaze of birds standing on the cable wire to re-edit the perception of the metropolis from a stranger’s point of view. The cutout of the city landscape reminds us there are many that we haven’t seen when we are already exhausted by what we in front of us every day. Using everyday commodities, Pedro Valdez Cardoso presents a theater play of objects about cultural interaction and commercialization along with the process of cross-border trade. In contrast, Vasco Araujo studies the everyday objects in history with an archeological approach, at the same time takes in the historical heritage of Chinese porcelains that was exports all over the world since the 16th century. It is right the fact that the immemorial past did leave something behind for us that infiltrates us with a both sweet and blue tone. These things strike down into the very depth of our nature and touch the chords of saudade. Shi Yong’s neon light of saudade might cheer us up. But be careful, the immemorial place in time is just like the Neon which seldom combines with any other chemical element, saudade is as inviting as confusing. If you look closer into the mirror of Jose Pedro Croft’s sculpture which contains the surrounding scenery into its self-construction, all that you can see is exactly yourself. Floating and concretely touching the ground are two facets of our existence, lacking each of them will lead us into the mash of nothingness. To calibrate our own position, it is helpful to look at the others from time to time. Functioning as the factory of the world, today’s China has attracted huge worldwide attention in such a short period of time. On the other hand, as a bright star in the Age of Discovery which weaved the scattered cultures in the world into a whole at the first place, Portugal stands undoubtedly as a prolocutor for globalization, too. 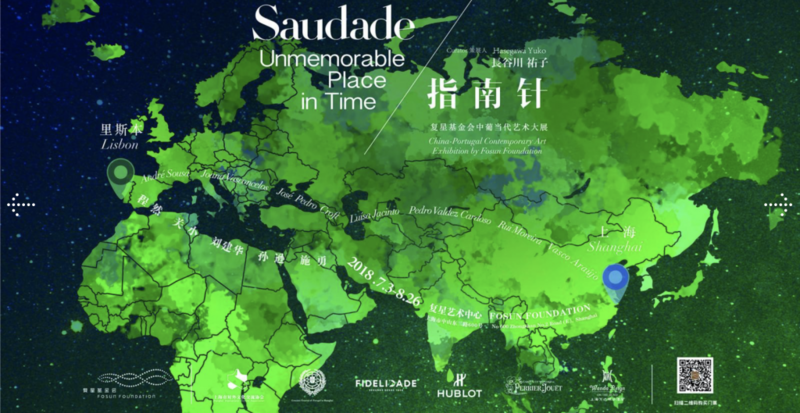 Particularly, the fruitful material, technological, and cultural exchanges between China and Portugal through the Marine Silk Road makes the two countries as a pair an attractive case for digging into the time & space dynamism in the present and perhaps in the future, as well as two different examples which cast unique opinions on globalization from different perspectives at the same time sharing something similar. Presenting ideas from the two countries through artworks, will surely bring fresh air to Sino-Portugal relation, and to the understanding on who we are, where we are, and where we are going to from now on.